Our organization collaborates with local communities to further their development amidst the challenges and shortcomings that they face. We aim to preserve the traditional wisdoms and ways of life by applying innovative methods to ensure its sustainability. Prior to their arrival, volunteers are given a “Welcome to Indonesia” handbook, a guide document containing the general information about the country, as well as its social, political, and cultural condition. Our programs equip volunteers with intercultural orientations prior to their departure for their volunteering destination. These orientations will be facilitated by local intercultural experts. Volunteers are expected to learn, adapt to, and be involved in the local culture and activities during their stay. They are briefed prior to their arrival, during their arrival, and when they return home, in order to facilitate the process of cultural exchange. Our community service projects encourage volunteers to provide facilitations in capacity building workshops, in order to assist underprivileged members of the community in pursuing higher education or securing better job opportunities. Our organization employs local agents within the community for our tour activities and chartered transport. We also support small businesses in the area by staying in family-run accommodations and eating at local eateries. Our volunteers are supported with a dedicated facilitator from the organization of their volunteer placement, who are financially subsidized from the volunteer’s paid program fee. Our application process is done entirely online. Applicants’ required documents are uploaded into our system for submission. Correspondence with applicants are also conducted online. Artisan food production, using traditional methods of producing food and spices in Ende, Flores. Work in collaboration with honeybee farmers to conserve honeybees, which are decreasing in population all over the world. 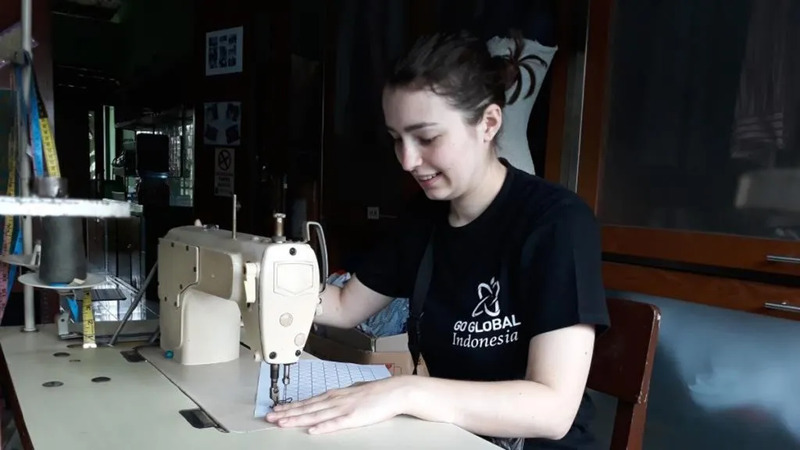 Volunteers who are placed in the deaf-mute community in Bali are expected to facilitate workshops in managing waste and maintaining the environment. Our program in Belgium challenges volunteers to create and manage art exhibitions in an art site that are eco-friendly and self-sustainable. We minimize the use of paper by printing documents in moderation and prioritizing the use of soft copies whenever possible. We also limit the printed copies of our brochures. Our staff are encouraged to take public transport instead of personal vehicle to work. Currently, nearly all of our staff opt to do the former. Each destination has their own unique environmental characteristics, and our staff and volunteers will be briefed by the local facilitator on saving water and energy during their stay, as well as care for the local wildlife and ecosystems. the poor design of our programs and operations. We aim to achieve this through compliance with Indonesian child protection laws and the relevant laws in each of the countries where we operate and by adhering to Article 19 of the United Nations Convention on the Rights of the Child (UNCRC) 1989. This convention defines a child as anyone who has not reached their 18th birthday irrespective of the age of majority in the country where the child is, or in their home country. report and respond to all child abuse incidents to the appropriate body of authority.